Is a Tesla the Best Car for a Prepper? 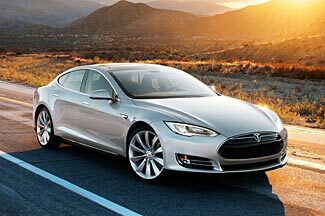 The stunning Tesla S has a best-case range of over 300 miles between battery charges. One of the big problems we all have to consider is what sort of motorized transportation we can use in a Level 2/3 situation. The problem is that modern-day fuels – gasoline, diesel, liquid propane and compressed natural gas – are all vulnerable to disruptions in supply, processing and distribution such as would occur in any sort of emergency situation, and so we’ll largely be forced to rely on such stored fuel as we may have, and when that runs out, our options become difficult. Sure, you could look at ways to make your own bio-diesel, and that might become a necessary option. You could also look at modifying a vehicle to run on wood gas. And some people, by choice or necessity, will allow themselves to settle for horses or oxen. But there’s another option worthy of consideration, especially in Level 2 and early Level 3 scenarios. An electric vehicle that you can recharge from solar or wind power. This is of course not a cheap option, because the first thing you need to do is buy an electric vehicle. But if you have the budget to consider such things, and depending on the amount of surplus renewable electricity you expect to be generating each day, it might be your best option. Just as with any other powered vehicle, the range you get depends on your speed, driving style, and the terrain. There are some major differences in how battery mileage is tested in the US, Japan and Europe, so we’re generally using US EPA quoted figures, which may or may not be exactly realistic, but which tend to give the lowest claimed ranges, so they are probably better than the other tested range claims. If you are evaluating electric car ranges, make sure you understand how the range figure was established – the latest US EPA test is a ‘five cycle’ test and more complete than its earlier two-cycle testing. Their range also depends on how much of the battery’s full charge is used. Generally it seems to be considered best practice not to 100% deplete the batteries. A Tesla Model S has either 60 kWhr or 85 kWhr batteries, and can get you 350 miles or more on a single charge in optimum conditions. We are not certain how much of the total stored charge is used. A 2013 Chevrolet Volt has a 16.5 kWhr battery and a 38 mile range, during the course of which it depletes 10.3 kWhr of its total battery capacity. A Nissan Leaf with a 24 kWhr battery gets 84 miles on a full battery charge, or 75 miles on an unstated lesser amount of charge. AA Ford Focus Electric with a 23 kWhr battery gets 76 miles per EPA figures. Looking at these and other numbers, it seems fair to say that each mile driven in an electric vehicle takes somewhere in the order of 250 – 300 Whr of electric energy. To translate that to other terms, you could run a 20 watt LED/CFL lightbulb for 12 – 15 hours with the same amount of power required for an electric vehicle to drive one mile. You could run a 1600 watt heater for 10 minutes with the same power that takes the electric vehicle one mile. Say you have a solar panel setup that gives you 5000 W of power when the sun is shining on them. You might think that you can connect the solar panels up to your electric vehicle, and if the vehicle has, say, a 20 Whr battery, then a simple calculation suggests that you just need to charge it for four hours and you’ve put 20 kWhrs of charge into it. Unfortunately, that’s an over-simplification. You need to adjust for the various inefficiencies and conversion losses you’ll experience from when the power comes out of the solar panels until when it ends up stored in the vehicle battery. You should figure on as much as 30% of the power from your solar cells being lost in the process of taking them from the original low voltage DC solar cell output to a high voltage input (often in AC) to the charger unit for the vehicle, and through that and in to the batteries themselves. It would probably be prudent for you to talk to the car manufacturer about a direct DC input to the vehicle’s charging system. If you can go straight from DC to DC, this might give you a considerable improvement in efficiency, but depending on the vehicle and its DC charge voltage (which could be very high), this might not be feasible. There is another electricity need as well. You can’t leave a car with a dead battery. You need to keep the battery with a certain minimum amount of charge, and because the batteries self-discharge at a slow rate, you need to be topping the vehicle up every week or so whether you are using it or not. One more thing to consider is that charging your vehicle will probably take considerable time. If you can provide, say, 5 kW of power, then you’re looking at probably a full sunny day of solar power for a Leaf or Focus to be charged, and two or three days of this to charge a large capacity battery (but longer range) Tesla. And if you thought you’d pack a portable solar kit in the back of the vehicle and charge it at your destination prior to returning home, that is probably impractical. If you had a 200 W solar array (uncommon, but here’s a site selling 150 W and 300 W portable panels), then it would take about two hours of charging for each mile of range added to the car. If there were 8 – 10 hours of sun in a day, that would give you 4 – 5 miles of extra range. Unlike the lead-acid starter battery in a regular vehicle which works until, one day, it no longer works; electric vehicle batteries don’t usually catastrophically fail. Instead, they slowly but surely degrade, meaning they hold less and less charge with each successive discharge/recharge cycle. Their rate of deterioration depends on various things, with the two major issues being the simple passing of time, and the number of cycles of charge/discharge they experience. Chevrolet warrant their Volt batteries for 100,000 miles or 8 years and estimate that the battery will have lost 20% of its ability to hold a charge by the end of that time. Its battery warranty is a slightly complex consideration though because the vehicle is dual-fuel; it will be running on its gasoline engine for an unknown percentage of the warranty period, as well as sometimes off its batteries. Tesla warrant their batteries for eight years and unlimited miles, and will replace them if their capacity diminishes by 30% during that time. So it seems that we can expect probably ten or more useful years from a battery pack, no matter how much we do or do not use it. That’s both good and bad – what say TEOTWAWKI occurs just a month or two before you were planning on (needing to) replace your battery pack? As long as you have a reasonably new battery pack, you’re good for up to ten more years of battery life, but otherwise, you’re going to have a much shorter useful remaining life, and because the batteries slowly decay even if sitting unused, you couldn’t keep a supply of spare batteries to extend the total life of the vehicle. Needless to say, there’s no way you’ll be able to build your own high-tech lithium ion battery. Once the one in the car is no longer functional, that’s it until – if/when – the high-tech world we luxuriate in is restored again. So why would you even want to consider an electric car in a Level 2/3 situation? After all (at least per our standard definitions) a Level 2 situation is all about living off stored resources until such time as normalcy returns, and a Level 3 situation assumes normalcy won’t return any time in the foreseeable future and requires you to fully transform to a sustainable ongoing lifestyle. But there may still be room for an alternate technology in both situations. An electric car reduces your reliance on stored fuel while you still have any (a Chevrolet Volt type solution – a vehicle that will run on either battery or gasoline would be ideal), and in a Level 3 situation, an electric car gives you additional capabilities that animals don’t have – the ability to travel an extended distance at speed, at least for as long as there are passable roads, and to the limit of your battery range. Unless you spend a lot of money on a Tesla, the present selection of electric vehicles all have limited range – about 30 – 70 miles, depending on driving conditions. There’ll be no recharging stations for you en route WTSHTF but if your retreat is within 10 or so miles of a local community, making roundtrips between retreat and community possible on a single charge, then in a future Level 2/3 situation, the electric vehicle can be useful. Clearly, it is not an essential item that you must have as part of your basic core prepping supplies, but if budget and circumstance allows, it might be a valuable additional option. It goes without saying that ‘your mileage may vary’ in terms of the actual range you get out of your vehicle. In addition to all the usual range-affecting factors that you are familiar with when driving a regular gas-powered vehicle, an electric vehicle’s range also varies significantly if you need to use its heater or a/c unit (headlights don’t make such a big difference). But there’s another factor to also keep in mind. Every time you discharge and recharge the lithium ion batteries, their capacity diminishes slightly – maybe by less than one tenth of one percent, which sounds like nothing until you think forward to what happens after the 100th or 1000th charging cycle and then all those tiny reductions in storage capacity have become significant. The chances are that the useful life of your vehicle’s battery system will be determined not by its sudden complete failure, but by its gradual reduction in driving range below the point that you need. For example, if your retreat is 12 miles from the nearest town, and you have a vehicle with a 35 mile range, you start off, with a brand new battery, needing to drive 24 miles with a 35 mile charge. That’s easy. But after some years, the batteries have lost 20% of their storage capacity and you now have to drive 24 miles on a battery that holds a 28 mile charge. That’s getting to be ‘touch and go’, isn’t it. Then, in another year or two or three, the batteries reduce down to having the same range as you need to drive, and what happens then? Remember where we commented, above, that recharging the vehicle away from a heavy-duty high current source of power will take almost literally forever. In other words, the vehicle has essentially become functionally useless, unless you can arrange for some source of recharging in the local township you make your roundtrip visits to. Our points here are three-fold. First, take all range claims with a grain of salt. They’re probably not as inaccurate as some of the claims made for regular vehicles that you drive ‘normally’, and in the future, you’ll almost definitely drive an electric vehicle as super-economically as possible, but even so, allow yourself a margin of error between the claimed range and the actual range you might get. Second, if your typical roundtrip distance will be close to the claimed range capability of the electric vehicle when new, you’ll only have a limited life before the vehicle’s range has reduced below that you need. Third, because the effective life of the vehicle will most likely be limited by its gradually reducing range, the longer the range it has when new, the longer its effective life will be before that range has diminished down to useless. An electric car offers several benefits compared to regular gasoline powered vehicles. The first benefit is that, as surprising as it may seem, an electric car should be more reliable than a regular internal combustion engine powered vehicle. It has many fewer moving parts, and many fewer stressed parts. With the local dealership no longer being available to fix your vehicle any time it develops a problem, a reliable vehicle becomes much more essential. The second benefit is that electricity is an easier fuel source to create and replenish than petrol. This might also seem counter-intuitive, but the chances are your retreat will have multiple ways of generating electricity but no ways of making petrol. At a stretch, you could come up with a bio-diesel or a wood gas type system, but complexity issues start to increase in such cases. The third benefit is that it is quite likely you will simultaneously be desperately short of energy in general, but also have occasional surpluses of electricity. An electric car provides a way for you to store and use any surplus electricity you are generating, rather than have it go to waste. What About the Prius and Other Hybrid Vehicles? Do not buy a Prius or other hybrid electric vehicle. These cars essentially have no ‘stand alone’ or independent electric power capacity. They are designed to recover, store, and re-use power from the vehicle when it brakes, so their batteries have very limited capacity and their electric motors are primarily boost or assist motors, capable of powering the vehicle only at low speeds. These are great cars, for sure, but they are best thought of as super-efficient gasoline powered cars. Without available petrol, they are useless; indeed, most of them have no provision for external charging. They also have very low capacity batteries – a typical Prius has about a 1 kWhr battery, of which only about half is available for use in powering the vehicle. This is a perfectly sensible design for its prime purpose – recovering and reusing energy that would otherwise be lost every time the vehicle brakes, but it is clearly totally insufficient to allow for fully electric-powered travel for more than a mile or so. The plug-in version of the Prius has a larger battery – 4.4 kWhr – which gives it about an 11 mile range. This is great when you have gasoline in the tank to fall back on as soon as the 11 mile range has been used up, but not so great as a purely electric vehicle in a future scenario where gas is no longer available. There are quite a few different models of electric cars out there, although most sell at best only a few thousand units each year, so you’re not likely to find one on the local used car lot any time soon. Furthermore, it is our sense that the technology is steadily evolving, and with the batteries having a finite life, there are definite costs associated with buying a second-hand electric vehicle. It is good to delay buying an electric vehicle as long as possible – but if you decide you can afford one and can justify one, be careful of this strategy. You might find you leave it too late! Rather than list the vehicles currently available – a list which risks being incomplete and quickly going out of date, we suggest you look at these two Wikipedia pages – a list of electric cars currently available and a list of production battery electric vehicles, to see whatever is currently out there. Most of the electric vehicles are solely electrically powered. But there are a few (most notably the Volt) which combined both a regular petrol engine with a battery/electric motor, and while these might have shorter electric ranges, they open up an interesting possibility for the future. First, their shorter range (ie about 35 miles for a Volt) might be sufficient for short runs between your retreat and the nearest township. And, second, you might be able to modify the petrol powered engine to run on wood gas. This would require considerable effort on your part, of course, but by making a hybrid electric/wood gas vehicle, that would seem to give you the best of both worlds for the future. In our wonderful modern world, with gasoline prices amazingly low (even $4.50 a gallon is ‘low’ compared to the true replacement/alternate technology costs of energy) and petrol freely available at gas stations open 24/7 just about everywhere in the country, electric cars make no sense for most of us. While it is true you save money in per mile fuel costs when running on electricity; overall, and for most of us, the up-front extra cost of the electric car outweighs the per mile savings. Even if there is an eventual saving to be had, the inconvenience of the range limitations of electric vehicles, and the time it takes to recharge them, reduces the use of electric cars to essentially around-town runabouts. But in the future, when gas disappears from the gas stations, and other liquid fuel replacements become massively more expensive than petrol even at its highest current prices, electric cars may become much more useful for shorter range transportation. Most of us will find it easier to generate electricity (to power a vehicle) than to create petrol or diesel.